Once I saw I was running too late to catch Berserk, I figured some brunch may be a good idea, and remembered Kurt Halfyard raving about a place called Cacao 70 earlier in the festival (and also still highly wired from the mocchachino, hours later). So I figured I'd try that out - an hour would surely be enough time to get in and out, right? Combine that with not wanting to see Excision again and the short program opposite it being in French, and it was a short day that maybe should have been shorter - by the time midnight came, I was full of poutine and couldn't make it through Revenge. The Q&A for Eddie: The Sleepwalking Cannibal was a good one; Boris Rodriguez is local and had a lot of friends and family there. Dylan Smith, second from the right, played Eddie, and there was a fair amount of "we can joke about it now, but damn, I almost got frostbite" when they discussed shooting him running aorund out in the snow in his underwear. Real snow, real cold. 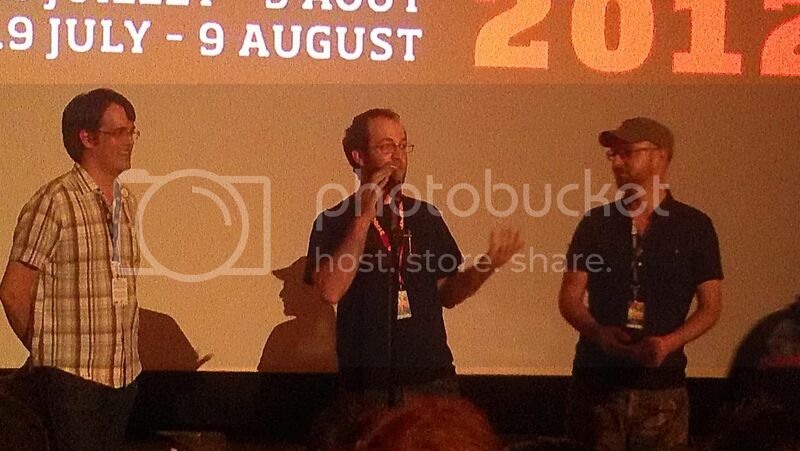 Fantasia's Nicolas Archambault with "Attack of the Brainsuckers" co-writer Chris Bavota and director Sid Zarforlin. 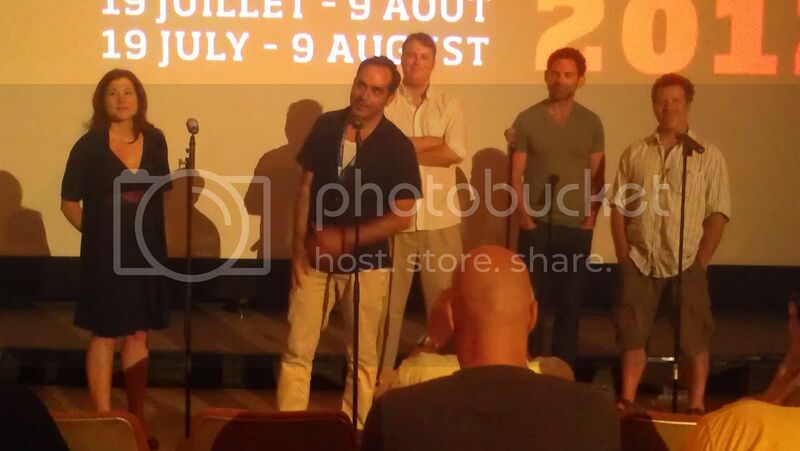 Their short played before Grabbers, and was a pretty good one (loved the sci-fi-loving little girl in it), and they mentioned that they had come to the festival for years but this was their first time with a film. OK, time to hit the metro. My plan is Blood-C, The Sorcerer and the White Snake, Berserk, Columbarium, Poongsan, and Hail. We've all heard (or used) some variation on "my art comes from a dark place" before; there's also its close relative "suffering for one's art". Not exactly the inspiration you'd expect for a movie named "Eddie: The Sleepwalking Cannibal" - which, not surprisingly once you accept that premise, turns out to be more about other people suffering for ones art. By proxy. At one time a brilliant painter, Lars Olafsson (Thure Lindhardt) hasn't produced new work in years, and is now starting a teaching job at an art school in rural Canada. A recent bequest to the school requires it to see to the well-being of the benefactor's nephew, Eddie (Dylan Smith), a tall, simple mute of a man, and since he and Lars hit it off, Eddie winds up staying at Lars's place. It turns out that Eddie had a sleepwalking issue as a child, which involved attacking and eating small animals without knowing it, and it returns his first night in a new house. Except now he's bigger, the issue escalates... and when he sees the result, Lars is suddenly painting again. The way Eddie approaches the artistic process is interesting. Many movies have played with the idea of artists claiming that a lasting great work is being worth sacrifice, but the merit of the art in the larger world is seldom the issue here; it's all what Lars will do or allow, directly or indirectly, to be the one who creates it. Writer/director Boris Rodriguez never actually shows completed artwork, but does a great job of showing how an empty canvas can draw or taunt an artist so that the audience gets a feel for the forces acting on Lars, and how it can cause him to respond in terrible ways. Even if the name of Grabbers didn't make one think of the monsters in Tremors, the rest of the movie would, in the best possible way. It has the things that this sort of movie needs to succeed - a cryptozoological threat and an enjoyably eccentric cast of characters, with the latter naturally providing humor from their interactions while still having the sort of ingenuity needed to counter the former's very real danger. Soon after the crew of a fishing boat mysteriously disappears near Erin Island, Ireland, another boat arrives, this one a ferry bringing model Dublin Garda Lisa Nolan (Ruth Bradley) to work alongside Ciarán O'Shea (Richard Coyle). The two events aren't related; the island's other local officer just needs someone reliable to share duties with oft-hungover O'Shea while on holiday. Of course, when a pod of pilot whales washes up on sure, mutilated, and local lobsterman Paddy Barrett (Lalor Roddy) catches a small "sea monster" in his trap, things start to get hairy for the cops and marine ecologist Adam Smith (Russell Tovey). It seems that this never-before-seen organism feeds by sucking its victims' blood, and can do so from a distance, but the good news is that it reacts poorly to alcohol. Yes, writer Kevin Lehane means to have some fun with certain Irish stereotypes, and if you don't foresee large chunks of the last act involving the characters "defending themselves" in the island's pub, you are very easily surprised. It's good fun, though, in part because it never seems to be the result of laziness or a celebration of boorishness - there's thought put into how this is deployed, the characters are different sorts of drunks, and O'Shea's alcoholism doesn't suddenly become a good thing. Grabbers isn't a one-joke movie earlier on, and it doesn't become one in its last act. I strongly suspect that while Revenge: A Love Story is many things, a midnight movie is not one of them. It's got a fractured timeline, events re-examined from different perspectives, and what seems like a really tight, intricately constructed story. It seems to, because I was out for a good chunk of it. Not the movie's fault at all - it starts with grisly, memorable imagery (murders of pregnant women who had the fetuses snatched from their wombs) and what I did see looked like a pretty great crime story. It's going on my list of "screeners I want", that's for sure.